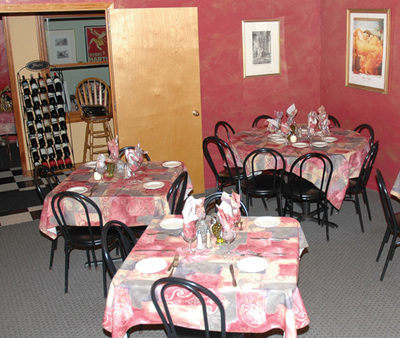 A Morehead City restaurant came by its cozy Italian atmosphere honestly. Gloria Pizzuti’s policy on sending compliments to the chef is as illustrative of her straightforward personality as anything could be. When a diner at Morehead City’s A Taste of Italy wants to thank the preparer of a particularly satisfying dish, Pizzuti obliges in her own inimitable style. “Why don’t you go back there and tell him yourself?” she says, and a delightful, frequent laugh follows. “Just be careful of the floor. It’s a little slippery.” Pizzuti, the co-owner and face of the restaurant, isn’t being dismissive. She’s being her personable, charming, hilarious, tell-it-like-it-is self, and she never turns it off. A Brooklyn native who moved to Italy when she was 18, Pizzuti works the softly lit, handsomely appointed room with a natural ease. She stops at a table and greets a group of regulars out of earshot, with the exception of intermittent bursts of laughter arising from her guests. Later she sits down with a group and has a glass of wine, and they laugh, too. She jokes with her staff as they walk by in a blur, making them feel less like employees and more like family. Pizzuti, 53, is part manager, part hostess, part mom and part standup comic. Dinner at the restaurant resembles dinner at her home, and that’s just the way she likes it. Connoisseurs of exceptional cuisine, fine wine and immoderate merriment can find everything they’re looking for in this quaint, authentically Italian establishment. 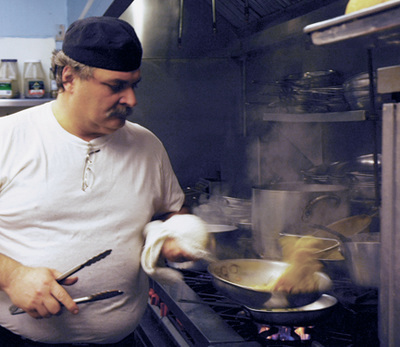 Pizzuti and her husband, Francesco, the Italian-born chef, ran the restaurant in Atlantic Beach as Pizzuti’s for five years before changing names and staking out a high-visibility location on Arendell Street three years ago. They renovated the former office building of a grocery store, turning what was a mundane, spartan structure into a cozy draw for lovers of life’s finer things. The menu includes classic pasta dishes from spaghetti Carbonara to cappellini Bolognese, as well as chicken, veal and seafood creations, the latter of which is the chef’s specialty. A Taste of Italy’s wine list includes many Italian selections to complement both the food and the company. Like many couples who run restaurants, Gloria Pizzuti works the front of the house while Francesco works the back. The banter between the two goes back and forth, sometimes in English, usually in Italian and serious only when it absolutely has to be. Asked by a visitor, in the hours before the restaurant opens for the evening, when the two met, Gloria retreats from a dining room table to the swinging kitchen door. She opens it and yells, “How old was I when I met you? How long do I know you?” A muffled, distant answer comes back from her husband. It would be incorrect to say the Pizzutis have their restaurant’s operation down to a science. That process began decades ago, well before they knew one another. Gloria Pizzuti grew up working in her family’s New York restaurants, and she likes to say she was in the business before she was born. Her father was a chef, her mother’s father was a chef and a brother and sister are chefs. Her dad cooked on cruise ships until she was about 10, when he opened his first restaurant. When she was 14, he opened an upscale supper club in New Jersey, complete with a stage for live entertainment, a dance floor, two bars and three dining rooms. This was the genesis of her restaurant experience, where the bug bit her and never let go. 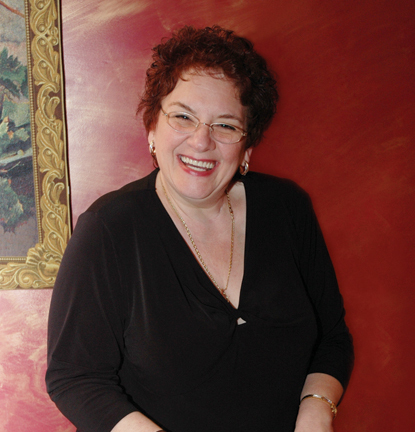 At 18, “ready to move on,” she recalls, Gloria moved to Venice. She was in Italy for 11 years, helping her father and brother run a restaurant there. It was in the mother country that she met Francesco, a police officer four years her junior, in a discotheque. She asked him to dance. He obliged and they’ve been together ever since. There was just one problem: Francesco’s idea of cooking was making a pot of coffee. They got married anyway and moved from Italy to New Jersey in 1983. While he dabbled in construction, Francesco, who grew up in a suburb of Rome, went to work in her father’s place—without pay— for six months. With a bit of a practical education in the business, he then ventured out to other restaurants. The couple opened a restaurant in New Jersey that was similar to their current establishment. Eventually, with a desire to be near the water, they moved South eight years ago and opened Pizzuti’s a few blocks from the beach. In her youth, Gloria’s father imparted to her and her siblings more than mere technique and business acumen. If a person came in hungry, he told them, it was their obligation as members of a chosen profession to feed them. Occasionally, a customer would come into their New Jersey restaurant and order food without the money to pay for it. Remembering her father’s words, Gloria would feed them anyway. Telling the story, she grows wistful, somber even, for a moment. It never lasts long. Not wanting potential freeloaders to get the wrong idea, Francesco cracks, “But don’t put that in the magazine,” and laughter erupts as the room’s characteristic lightheartedness is restored. The Pizzutis, who usually work late into the night, like to wind down with quiet walks on the beach as the moon shimmers off the water. Gloria grew up around Coney Island, where she would accompany her grandfather as they got mussels off the jetties and took them home for dinner. The laughter trails off and Francesco, standing, looks down at his wife of nearly 25 years, sitting at a table before the dinner crowd rushes in. “We do have a good time,” he says.